There is something inspirational when you listen to how Chef Naresh Kharbanda, Director of Food and Beverage at The Umrao started off his career as a Chef. Becoming a Chef seemed just a choice for him at first but by the time he realized, it had already become his passion. And today he lives with that passion! How long have you been with The Umrao Group and where did you work before this? I have been with this property since the day it got inaugurated. It has been a good opportunity to show my skills and I am (with a chuckle) still showing that. Before this, I was with IHG Group’s Crowne Plaza Hotel. I have been in this profession since 1991; so it’s been 25 years that I have been a chef now. How was the initial journey for you? I initially did not enjoy this profession much since it was an entirely different environment for me. I was also not very fond of cooking, to tell you the truth. My family background never allowed me to join the service/hospitality industry. In fact, I was totally blank of what I would take up after graduation. After I graduated from Zakir Hussain College Delhi with Honours in History, one of my neighbor, who is the owner of an Indian restaurant in London and an admired chef himself introduced me to this industry. I decided to give it a try and joined the Industrial Training Institute, Pusa in 1987. Believe me! Taking this 3-year course completely changed my mind. After completing my formal training from this institute, I started my career with Hotel Sofitel Suryaa, New Friends Colony. The day I joined, I was put in the Indian section of the Hotel and for 15 days I learnt lot many things. My first preparation was Dal Makhani which I was taught to prepare in my first 10 days. I still teach my guys till date to prepare Dal Makhani the way I was taught. My seniors were very impressed with me. After completing 15 days, I was sent to the Chinese restaurant ‘Sampan’. Since this was different from what I had started with, I had to start here from the scratch. My first task was to cut 20 kilos of fresh mushroom that took me an hour to cut. I was not happy with what I was doing then but had to accept it as that was also the day when I realized the importance of being a perfectionist in the kitchen. I worked under Chef Mahesh in this section and learnt a lot from him. He was the one to have given me the opportunity to make a stir fried vegetable dish with star anise for the Director of that Hotel, Mr. Luv Malhotra. I prepared it as directed and was complimented for my work. I never looked back after that and I learnt to prepare Chinese cuisine in 3 years. I joined Hotel Taj Palace, Delhi and later Hotel Grand Hyatt, Vasant Kunj (which is now The Grand) and also got the opportunity to work with the Kempinski Group. I even moved to Moscow for a change in 1997 and worked for Hotel International for two years. I worked with Chinese chefs there and honed my skills to include Malaysian and Asian cuisine as my expertise. On my return to India I rejoined Hotel Suryaa. For 10 years I worked in Asian cuisine, but then one fine day I realized that I have to grow my expertise, because being in this industry what matters most is the knowledge that you have. I never harbored the dream of becoming a Master Chef but I always wanted to reach the Top. After 10-12 years of preparing Asian cuisine, I decided to change my track to learn other cuisine also. I learnt many continental cuisines from different chefs. I got to learn Japanese and French cuisine from my Godfather in this industry, Chef Sushil Chugh, who till date still is my role model. I also read a lot of books to learn some of these techniques on my own. But in spite of learning so many cuisines, I would still call Asian as my specialty cuisine. What kind of struggle have you come across to become an accomplished chef? During the course of my journey I have lost many sweet memories. I, in a way messed up my personal life completely as I rarely got to celebrate festivals and enjoy with family and friends. My relatives were not in favor of this job and they had too much of negative thoughts about this profession as not many chefs were written about or showcased on TV like they are done today. I remember my father-in-law asking me once as what exactly is the work of a chef. But in some way I always remained satisfied and as you can see in the last few years this profession has become much more respectable. Today my 4 year niece would walk up to me and ask with curiosity – “uncle, are you really a chef? !” These little things do give me joy. When was the first time you cooked at home? The first time I prepared food at home was when there was a small get-together and I was forced to cook something for them. I made Kadhai Paneer and an Awadhi dish I don’t remember now. Everyone liked it. My morale got boosted and it made me realize that yes, I am the chef, because the same people who discouraged me once are now encouraging me so much. Who has been your biggest critic during your journey? In my 25 years of being a chef, I have worked with lots of international and national chefs. They all have guided me always and also criticized me when it was necessary. But despite that, I would still consider myself as my biggest critic and next to it will be my son. He is 19 years old but he is the best critic for me. Whenever we visit any other restaurant, he would tell me jokingly – “Kya Papa, aap aisa khana kyun nehi banate ho? And I love to hear that from him. Even he knows and understands what hardships I have seen in my career to come up to this position. What is your thought on fusion food? Which is your favorite fusion food? Fusion according to me is confusion. Your tryst with fusion would simply fail if you are not using the right ingredients in the right dish. You will happen to spoil whatever fusion you try. I prepared a dish a few years back combining chicken and pork, blending both Thai and continental style. This remains one of my favourite Fusion Food. Which style of cooking do you admire the most? I like “stir fried” and “grilled” food the most. In both these style of cooking, you can play with the food. You will have to be very specific while preparing gravy, but this is not the case with these two styles. These two styles may require a longer preparation time but cooking time is comparatively less. Plus they ensure the freshness of food. Which is your favorite ‘ghar ka khana’? Rajma chawal prepared in typical Punjabi-style is my all-time favourite. Give it to me in any meal I will relish it with pleasure. Let me give you a tip here. Try sometime having Rajma taken out of fridge with bread and hot tea, it will taste amazing. I also like Bengan ka Bharta with ‘matar’. Any advice you would love to give someone aspiring to become a chef? This industry wants dedication. The attitude and desire to be a chef is just as important as the formal training. The speed of growth is definitely accelerated with exposure to a culinary school, but can be compensated to a great extent with determination, sincerity to yourself and undistracted motivation to learn new things. Indeed, there is no limit to learning new things. My chefs encouraged me that I can do anything but I will have to give my dedication and time to it. You also have to be very passionate about what you are doing. Money is very important, I understand but you will have to work very hard to earn that in this industry. Honestly I do not get any free time. But whenever I get time, I try to spend it with my family. I also love watching cricket. What is your ‘signature dish’? Any recipe you would like to share with our readers? In my career of 25 years, I have prepared lots of dishes, but some of the dishes remain close to my heart like tea smoked lamb, wasabi filled pan grilled mushroom, garlic grilled pork chops and pan tossed date pancake. 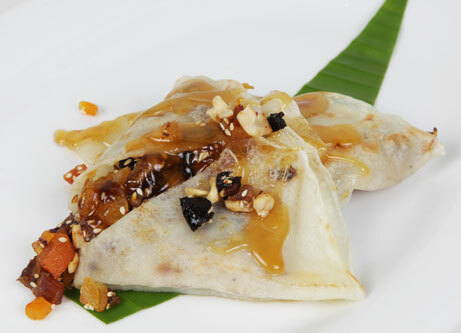 I will share with the readers the recipe of Pan Tossed Date Pancake with Palm Sugar. Heat the Pan; Add the Butter, Make Thin Pancake & keep aside. Take Pancake & fill all the mixture, Fold Tightly. 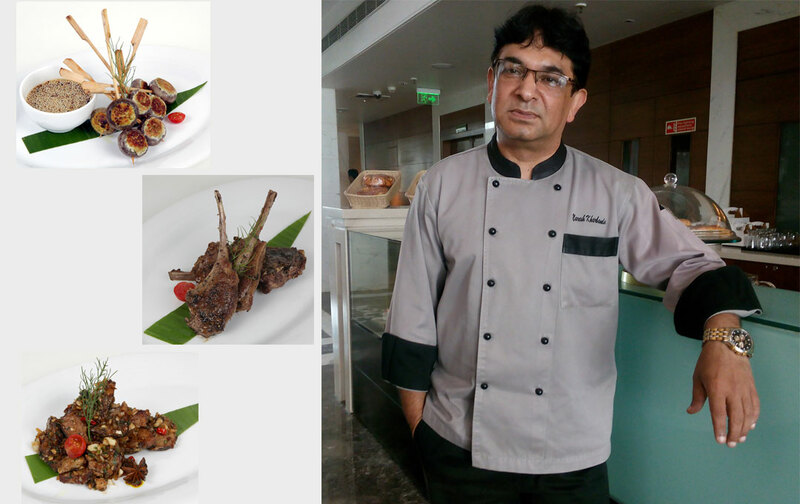 Share the post "Chef Naresh Kharbanda – Rekindling his Passion to be a Chef and Reach the Top"
Wow, its not easy being a Chef. Hats off to Chef Naresh and his dedicated team. Wish them all the best. I’m so excited to try this Pan Tossed Date Pancake with Palm Sugar recipe at home. Can’t wait. I fully agree with Chef Naresh that you have no time for family or festivals,but then this is dedication.I admire his spirit and dedication.God Bless. Thank you for sharing such insights with us Team Travel Rasoi.